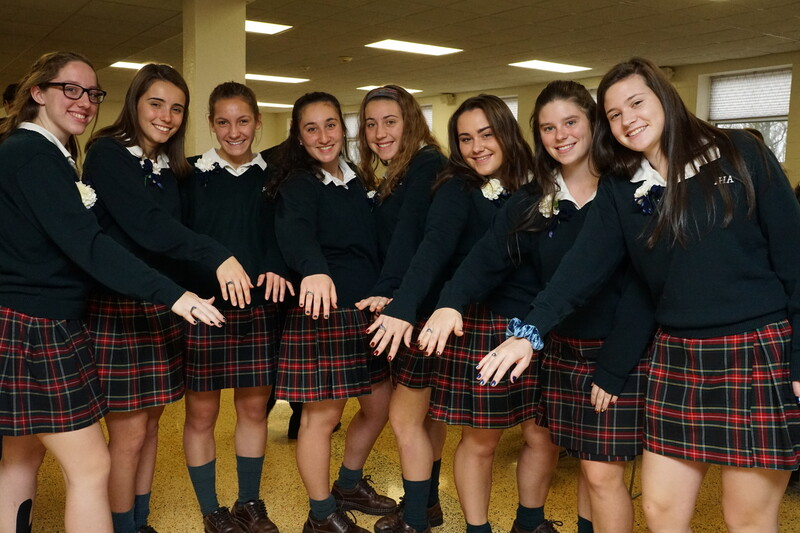 IHA’s class of 2018 received their Junior class rings on December 8th, 2016, with the entire school present to celebrate. The process did not begin on ceremony day, though. In the months leading up to the ring ceremony, the girls had to decide how to customize their own ring. Order forms were due in late September. The juniors had options of band color, such as platinum and gold. They were also able to engrave something in the inside of the ring. On the outside, a blue gem is surrounded by the school name. On either side of the ring students could put their name, class year, and symbols. Most choose symbols that represent their clubs and activities. While the students placed orders, a representative from Jostens, the high school memorabilia company that manufactures the juniors’ rings, came during lunch hours to size the students’ fingers. The ceremony began with a Mass to celebrate the Immaculate Conception. Father Ted was the celebrant and was incredibly engaging during the mass. In his homily, Father Ted discussed the dedication and responsibility that the juniors should hold as they are given their class rings. He also spoke about unity without sin and the unity that the Junior class will receive through their rings and this benchmark in their time at IHA. The Mass was accompanied by beautiful music from Praise, the IHA Church choir. After communion, Father Ted blessed the rings. Junior Class President Adrianna Oliver’18 spoke at the beginning of presentation of the rings. Mrs. Alice Rogers, Assistant Principal of Students, then called up the girls by name to receive their rings. There, the students swapped the ribbons that they wore on their fingers throughout Mass for their rings. 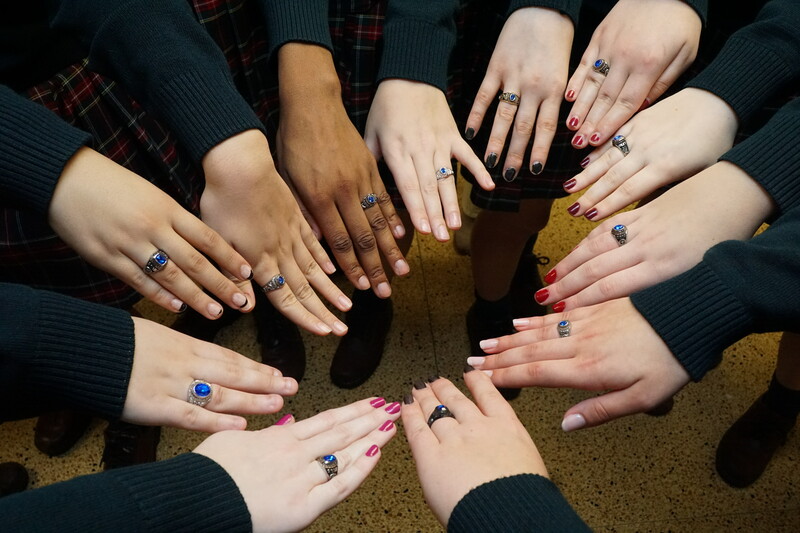 Señora Echeverria, Junior Class Advisor, handed the students their rings, and President Molloy and Principal Schlereth shook the juniors’ hands. 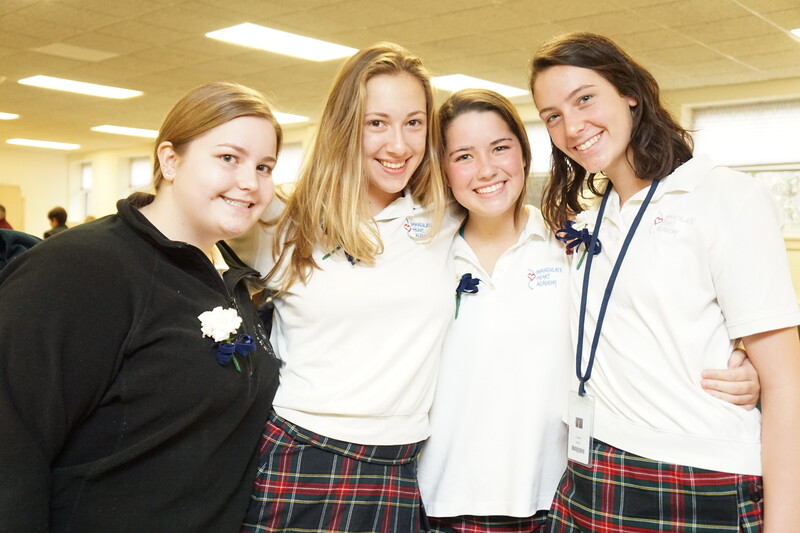 Throughout the Mass, the juniors wore white roses on their sweaters to symbolize this milestone. Many happy parents watched from the balcony as their daughters received their rings. The ceremony ended with a few words from Principal Schlereth about the IHA community. He emphasized the uniqueness of the school’s unity and communion and thanked everyone that worked to prepare for the ceremony. Following the ceremony, faculty, juniors, and parents attended a reception in the cafeteria. There, the girls posed for pictures and celebrated the event together. Breakfast and drinks were offered to the students and parents. It was certainly a memorable and beautiful event for all of the juniors and the entire IHA community.